The 18 voting members of the Council include the Regional Administrator of NOAA Fisheries in the Greater Atlantic Region (GARFO) and the five principal state officials with marine fishery management responsibility (or their designee) from CT, ME, MA, NH, and RI. Twelve other NEFMC members are nominated by the governors of the New England coastal states and appointed by the Secretary of Commerce for three-year terms. Additionally, four non-voting members represent the United States Coast Guard, U.S. Fish and Wildlife Service, U.S. Department of State, and the Atlantic States Marine Fisheries Commission. Council member financial disclosure forms must be available for public inspection on the internet and at the Council office. Details of this requirement are provided in the Magnuson-Stevens Fishery Conservation and Management Act in Section 302 (j) DISCLOSURE OF FINANCIAL INTEREST AND RECUSAL. 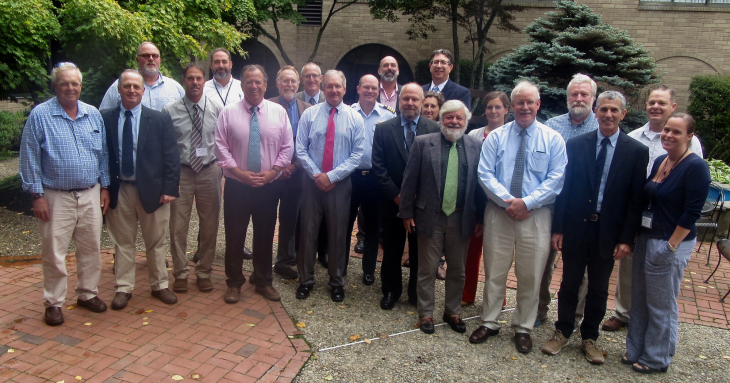 New England Fishery Management Council 2018-2019 members. Front row from left to right: Terry Alexander (ME), Vincent Balzano (ME), Scott Olszewski (RI), Council Chairman Dr. John Quinn (MA), Rick Bellavance (RI), Eric Reid (RI), Dr. Mike Sissenwine (MA), Doug Grout (NH), Dr. Jim Weinberg (non-voting, NEFSC), Elizabeth “Libby” Etrie (MA). Middle row: John Pappalardo (MA), Dr. Matt McKenzie (CT), Peter Aarrestad (CT), Capt. Kevin King (U.S. Coast Guard representative, non-voting), Meredith Mendelson (ME, proxy for Patrick Keliher), Melanie Griffin (MA, proxy for Dr. David Pierce), Council Vice Chairman Terry Stockwell (ME), Mark Godfroy (NH).